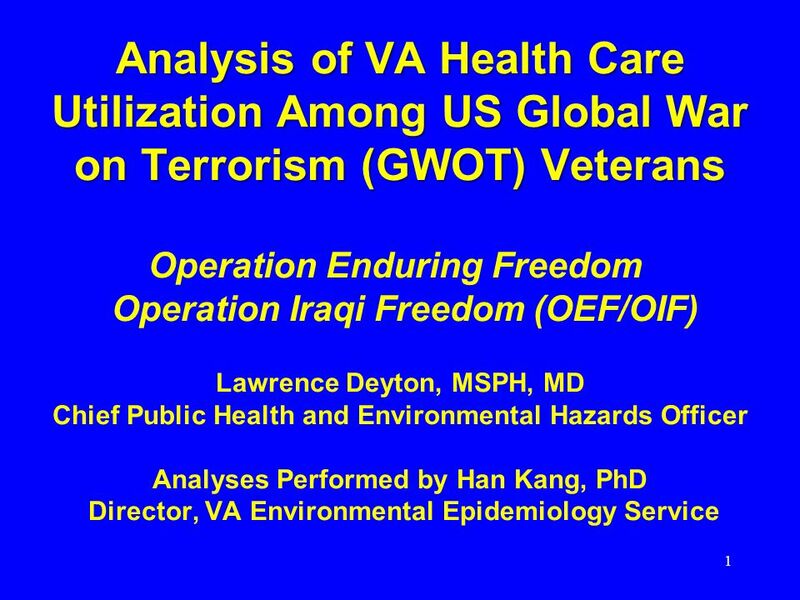 1 Analysis of VA Health Care Utilization Among US Global War on Terrorism (GWOT) Veterans Analysis of VA Health Care Utilization Among US Global War on. 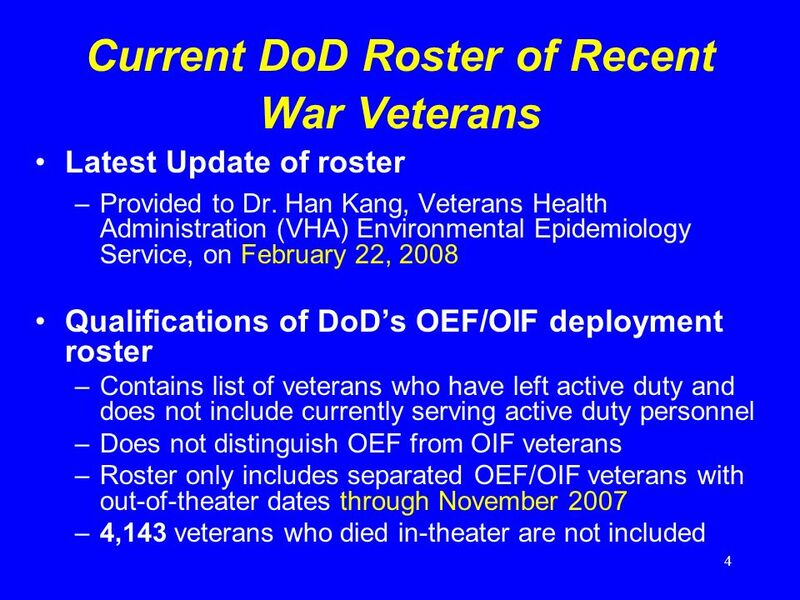 6 6 Use of DoD Roster of War Veterans Who Have Left Active Duty This roster is used to check the VAs electronic health records for VHA enrollment and the ICD-9 diagnostic codes are used to classify health problems. 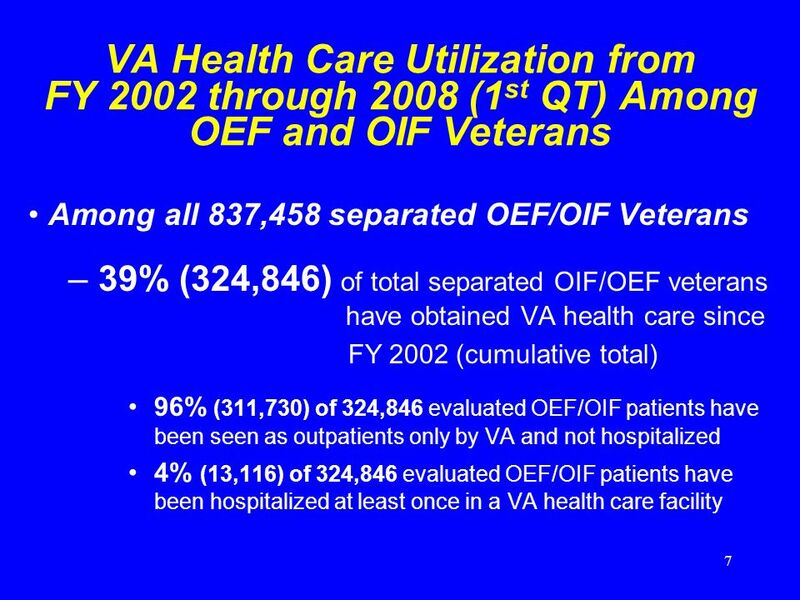 This determines which OEF/OIF veterans have accessed VA health care as of December 31, 2007. notThe data available for this analysis are mainly administrative information and are not based on a review of each patient record or a confirmation of each diagnosis. These data are important mainly for health care planning purposes. These data cannot be considered epidemiologic research data. 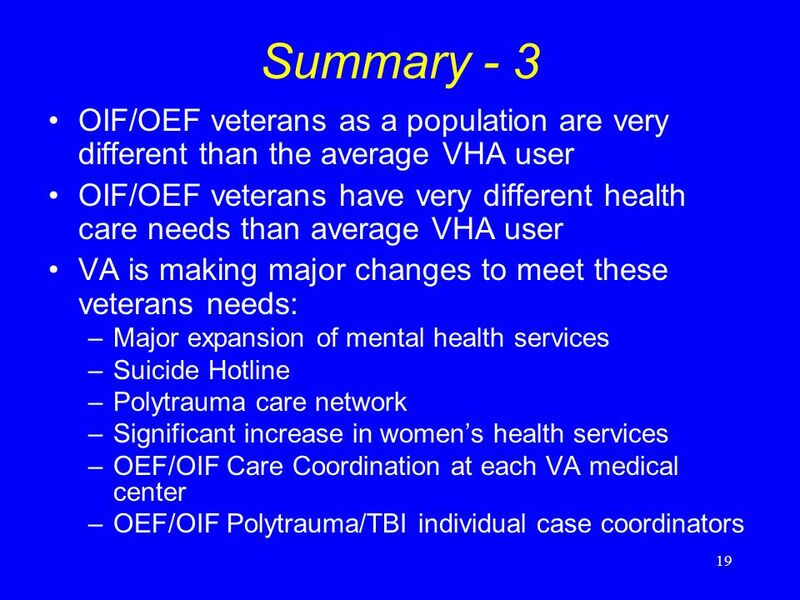 These are administrative data and must be interpreted with caution because they only apply to OEF/OIF veterans who have accessed VHA health care. 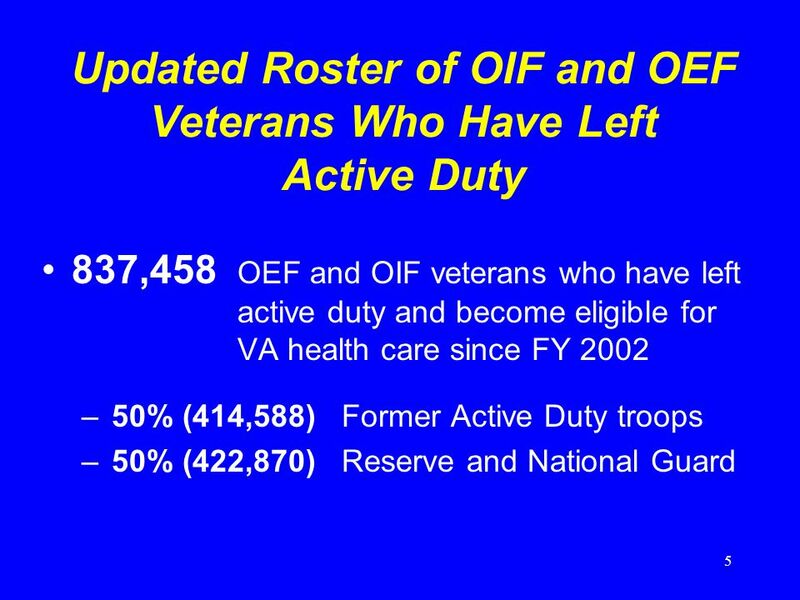 These data do not represent all 837,458 OEF/OIF veterans who have become eligible for VA healthcare since FY 2002 or the approximately 1.6 million troops who have served in the two theaters of operation since the beginning of the conflicts in Iraq and Afghanistan. These data are cumulative totals since FY 2002 and do not represent data from any single year. 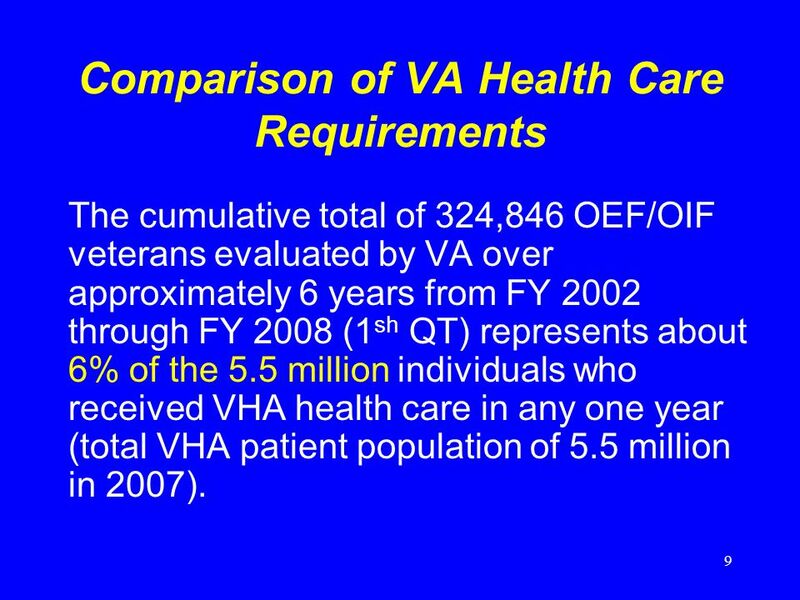 9 9 Comparison of VA Health Care Requirements The cumulative total of 324,846 OEF/OIF veterans evaluated by VA over approximately 6 years from FY 2002 through FY 2008 (1 sh QT) represents about 6% of the 5.5 million individuals who received VHA health care in any one year (total VHA patient population of 5.5 million in 2007). 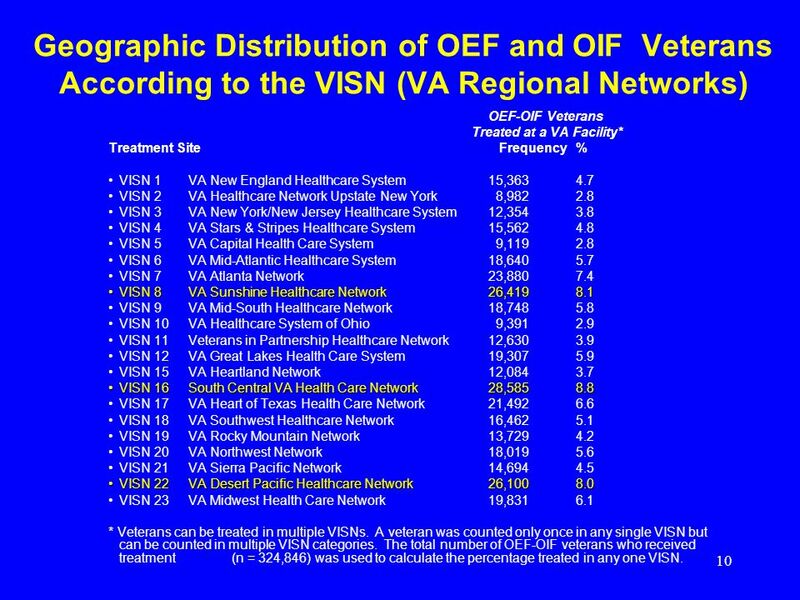 10 10 Geographic Distribution of OEF and OIF Veterans According to the VISN (VA Regional Networks) OEF-OIF Veterans Treated at a VA Facility* Treatment Site Frequency % VISN 1 VA New England Healthcare System15,363 4.7 VISN 2 VA Healthcare Network Upstate New York 8,982 2.8 VISN 3 VA New York/New Jersey Healthcare System12,354 3.8 VISN 4 VA Stars & Stripes Healthcare System15,562 4.8 VISN 5 VA Capital Health Care System 9,119 2.8 VISN 6 VA Mid-Atlantic Healthcare System18,640 5.7 VISN 7 VA Atlanta Network23,880 7.4 VISN 8 VA Sunshine Healthcare Network26,419 8.1VISN 8 VA Sunshine Healthcare Network26,419 8.1 VISN 9 VA Mid-South Healthcare Network18,748 5.8 VISN 10 VA Healthcare System of Ohio 9,391 2.9 VISN 11 Veterans in Partnership Healthcare Network12,630 3.9 VISN 12 VA Great Lakes Health Care System19,307 5.9 VISN 15 VA Heartland Network12,084 3.7 VISN 16 South Central VA Health Care Network28,585 8.8VISN 16 South Central VA Health Care Network28,585 8.8 VISN 17 VA Heart of Texas Health Care Network 21,492 6.6 VISN 18 VA Southwest Healthcare Network16,462 5.1 VISN 19 VA Rocky Mountain Network13,729 4.2 VISN 20 VA Northwest Network18,019 5.6 VISN 21 VA Sierra Pacific Network14,694 4.5 VISN 22 VA Desert Pacific Healthcare Network26,100 8.0VISN 22 VA Desert Pacific Healthcare Network26,100 8.0 VISN 23 VA Midwest Health Care Network19,831 6.1 * Veterans can be treated in multiple VISNs. 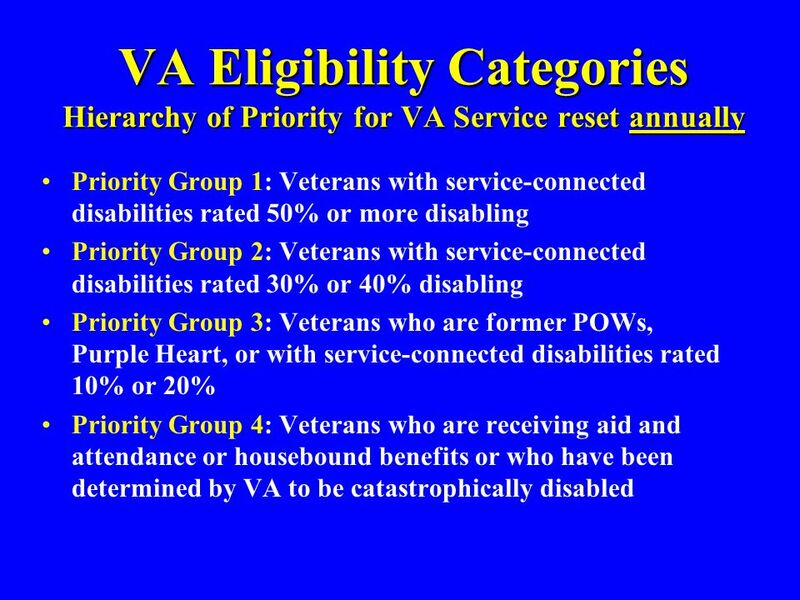 A veteran was counted only once in any single VISN but can be counted in multiple VISN categories. 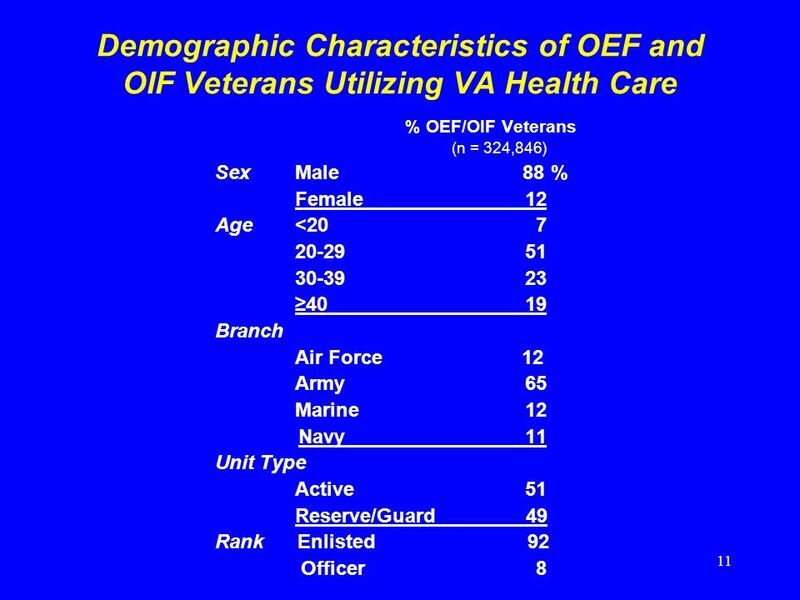 The total number of OEF-OIF veterans who received treatment (n = 324,846) was used to calculate the percentage treated in any one VISN. 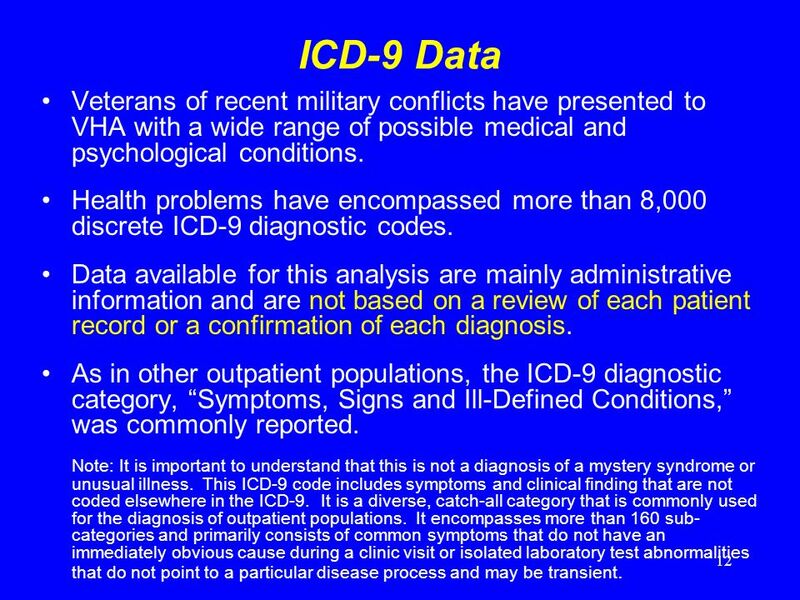 12 12 ICD-9 Data Veterans of recent military conflicts have presented to VHA with a wide range of possible medical and psychological conditions. Health problems have encompassed more than 8,000 discrete ICD-9 diagnostic codes. Data available for this analysis are mainly administrative information and are not based on a review of each patient record or a confirmation of each diagnosis. As in other outpatient populations, the ICD-9 diagnostic category, Symptoms, Signs and Ill-Defined Conditions, was commonly reported. Note: It is important to understand that this is not a diagnosis of a mystery syndrome or unusual illness. This ICD-9 code includes symptoms and clinical finding that are not coded elsewhere in the ICD-9. It is a diverse, catch-all category that is commonly used for the diagnosis of outpatient populations. It encompasses more than 160 sub- categories and primarily consists of common symptoms that do not have an immediately obvious cause during a clinic visit or isolated laboratory test abnormalities that do not point to a particular disease process and may be transient. 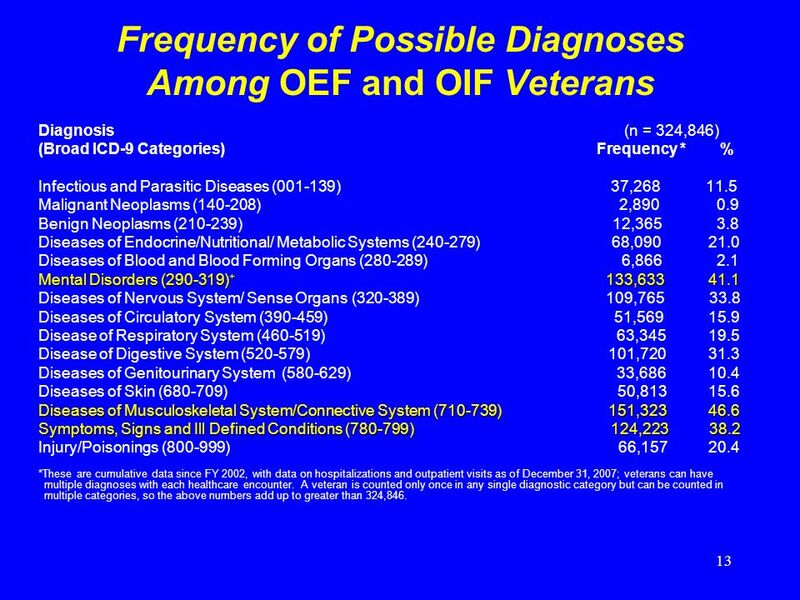 13 13 Frequency of Possible Diagnoses Among OEF and OIF Veterans Diagnosis (n = 324,846) (Broad ICD-9 Categories) Frequency * % Infectious and Parasitic Diseases (001-139) 37,268 11.5 Malignant Neoplasms (140-208) 2,890 0.9 Benign Neoplasms (210-239) 12,365 3.8 Diseases of Endocrine/Nutritional/ Metabolic Systems (240-279) 68,090 21.0 Diseases of Blood and Blood Forming Organs (280-289) 6,866 2.1 Mental Disorders (290-319) + 133,633 41.1 Diseases of Nervous System/ Sense Organs (320-389) 109,765 33.8 Diseases of Circulatory System (390-459) 51,569 15.9 Disease of Respiratory System (460-519) 63,345 19.5 Disease of Digestive System (520-579) 101,720 31.3 Diseases of Genitourinary System (580-629) 33,686 10.4 Diseases of Skin (680-709) 50,813 15.6 Diseases of Musculoskeletal System/Connective System (710-739) 151,323 46.6 Symptoms, Signs and Ill Defined Conditions (780-799) 124,223 38.2 Injury/Poisonings (800-999) 66,157 20.4 *These are cumulative data since FY 2002, with data on hospitalizations and outpatient visits as of December 31, 2007; veterans can have multiple diagnoses with each healthcare encounter. 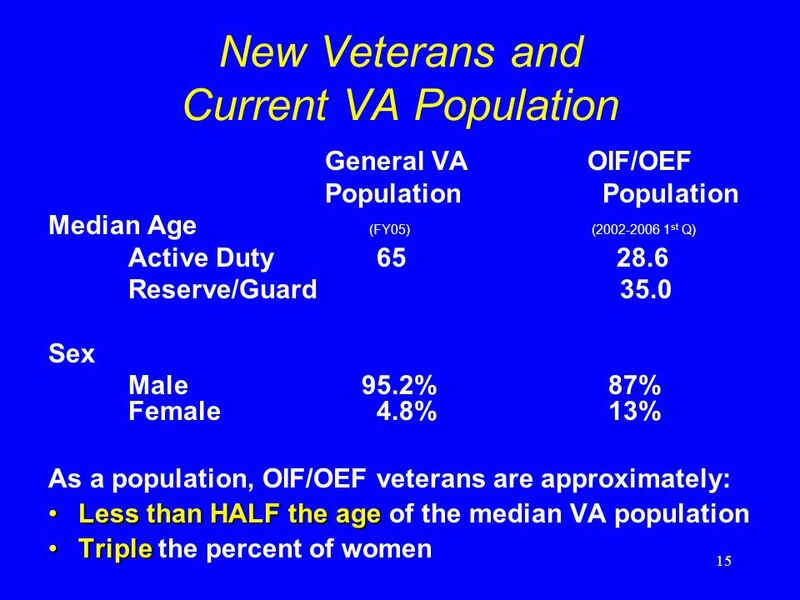 A veteran is counted only once in any single diagnostic category but can be counted in multiple categories, so the above numbers add up to greater than 324,846. 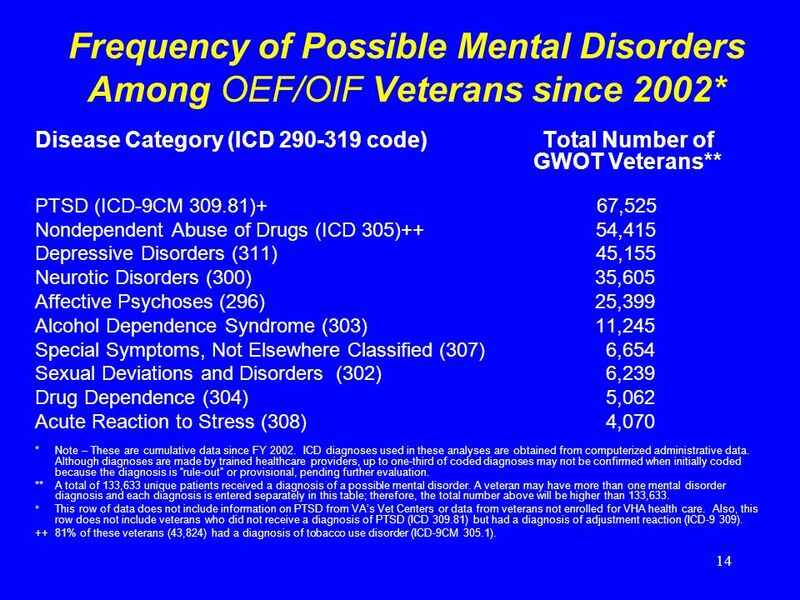 14 14 Frequency of Possible Mental Disorders Among OEF/OIF Veterans since 2002* Disease Category (ICD 290-319 code) Total Number of GWOT Veterans** PTSD (ICD-9CM 309.81)+ 67,525 Nondependent Abuse of Drugs (ICD 305)++ 54,415 Depressive Disorders (311) 45,155 Neurotic Disorders (300) 35,605 Affective Psychoses (296) 25,399 Alcohol Dependence Syndrome (303) 11,245 Special Symptoms, Not Elsewhere Classified (307) 6,654 Sexual Deviations and Disorders (302) 6,239 Drug Dependence (304) 5,062 Acute Reaction to Stress (308) 4,070 * Note – These are cumulative data since FY 2002. ICD diagnoses used in these analyses are obtained from computerized administrative data. Although diagnoses are made by trained healthcare providers, up to one-third of coded diagnoses may not be confirmed when initially coded because the diagnosis is rule-out or provisional, pending further evaluation. ** A total of 133,633 unique patients received a diagnosis of a possible mental disorder. 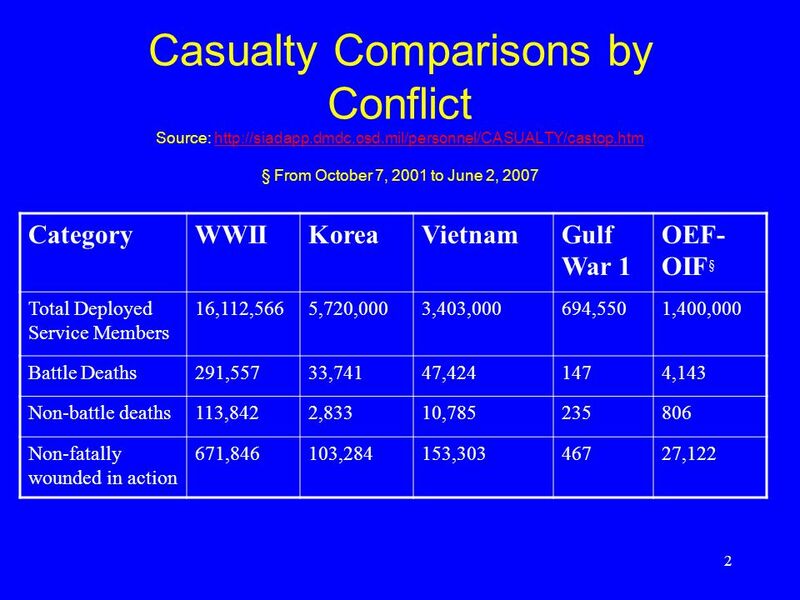 A veteran may have more than one mental disorder diagnosis and each diagnosis is entered separately in this table; therefore, the total number above will be higher than 133,633. 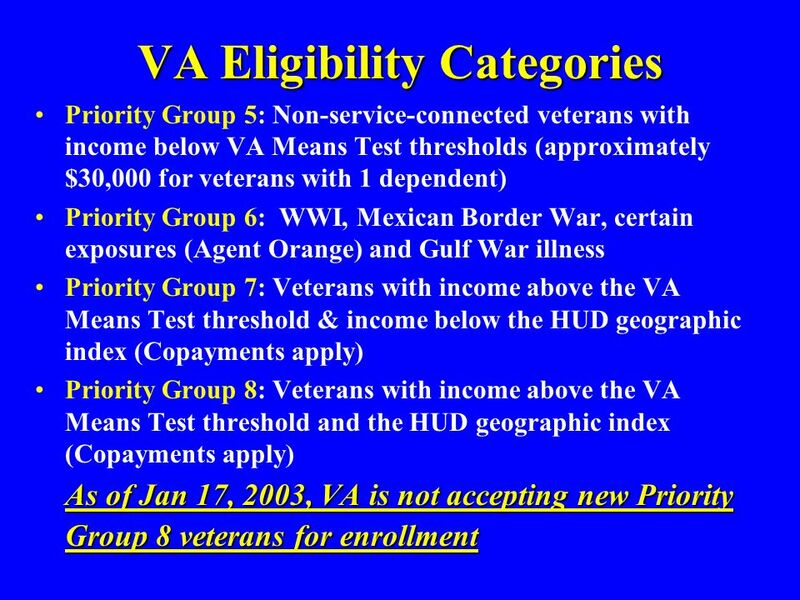 + This row of data does not include information on PTSD from VAs Vet Centers or data from veterans not enrolled for VHA health care. 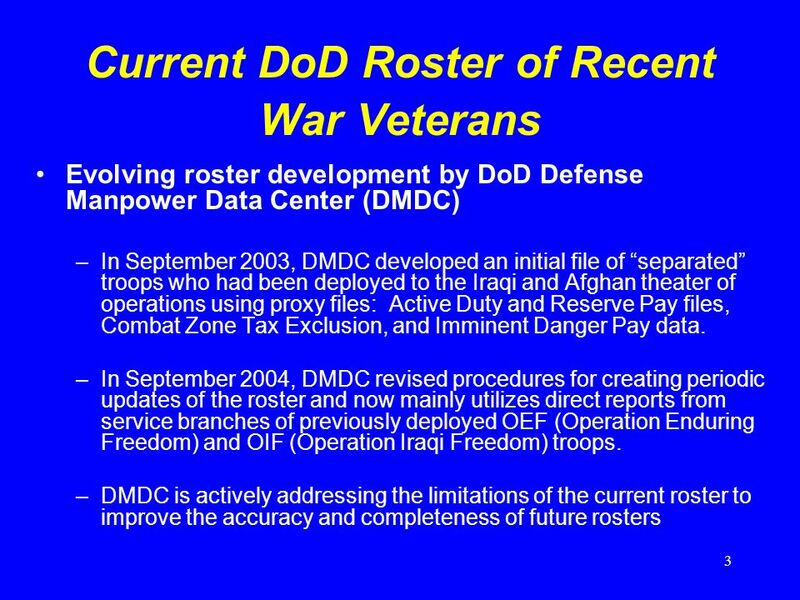 Also, this row does not include veterans who did not receive a diagnosis of PTSD (ICD 309.81) but had a diagnosis of adjustment reaction (ICD-9 309). ++81% of these veterans (43,824) had a diagnosis of tobacco use disorder (ICD-9CM 305.1). 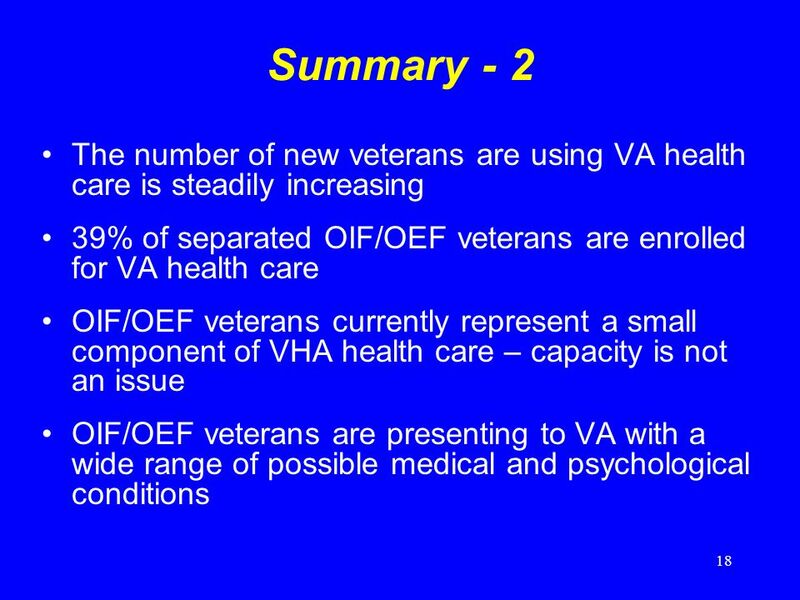 17 17 Summary – 1 Important Points to Remember The rate of VA health care utilization by OIF/OEF veterans may reflect the fact that these veterans have ready access to VA health care – free of charge for two to five years following separation for any health problem possibly related to wartime service. VA engages in significant outreach to inform these veterans of their benefits, including two personal letter from the VA Secretary and a personal phone call inviting them to enroll for VA health care to each new veteran when they separate from active duty. 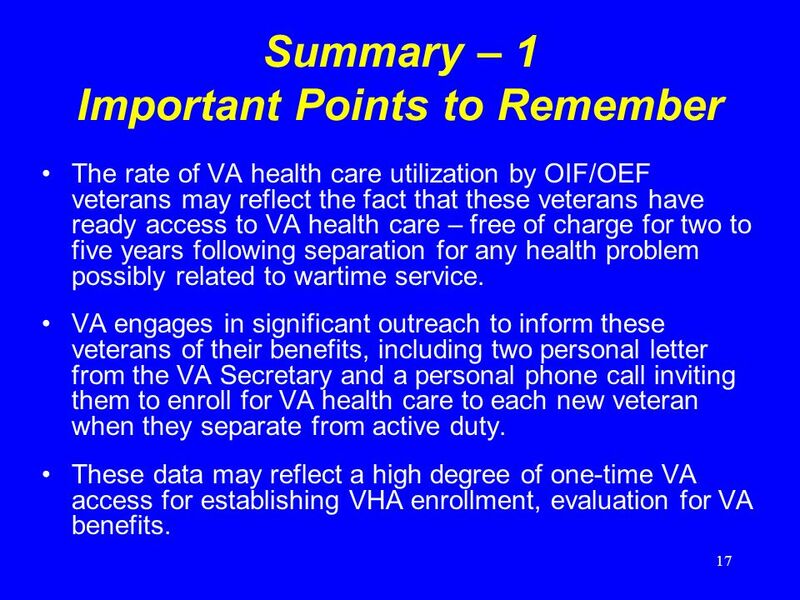 These data may reflect a high degree of one-time VA access for establishing VHA enrollment, evaluation for VA benefits. 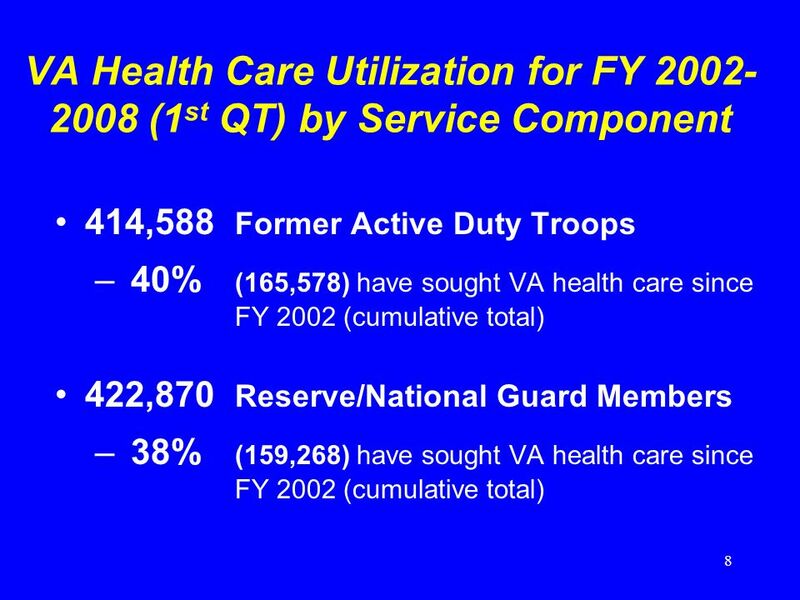 20 20 Caveats This analysis is reflective only of those veterans who sought VA care. 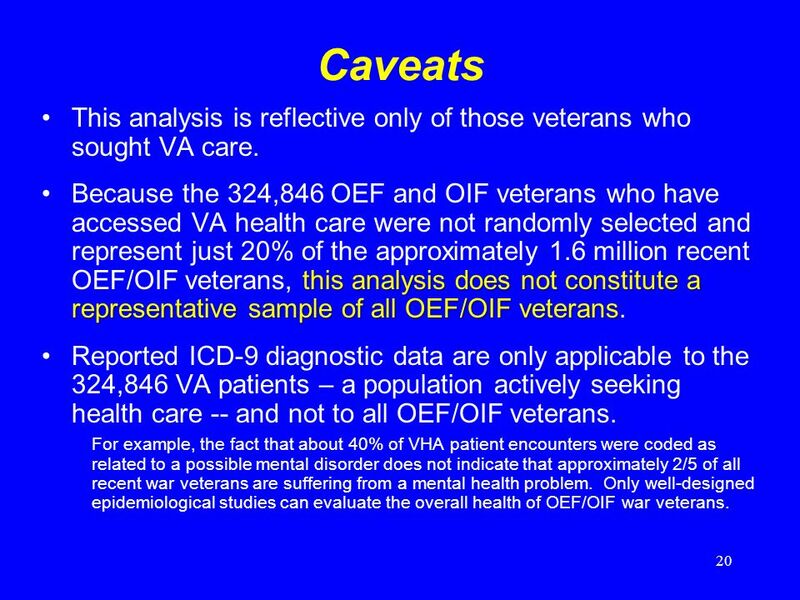 this analysis does not constitute a representative sample of all OEF/OIF veteransBecause the 324,846 OEF and OIF veterans who have accessed VA health care were not randomly selected and represent just 20% of the approximately 1.6 million recent OEF/OIF veterans, this analysis does not constitute a representative sample of all OEF/OIF veterans. 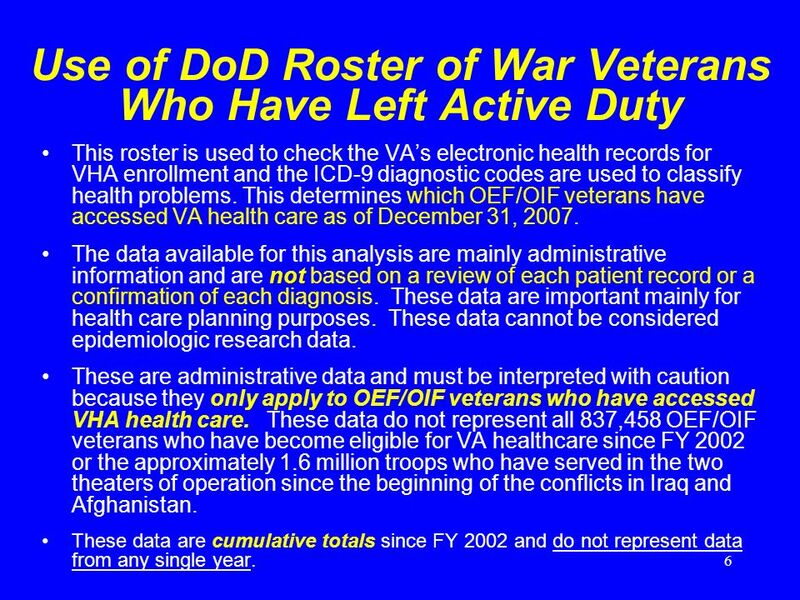 Reported ICD-9 diagnostic data are only applicable to the 324,846 VA patients – a population actively seeking health care -- and not to all OEF/OIF veterans. For example, the fact that about 40% of VHA patient encounters were coded as related to a possible mental disorder does not indicate that approximately 2/5 of all recent war veterans are suffering from a mental health problem. 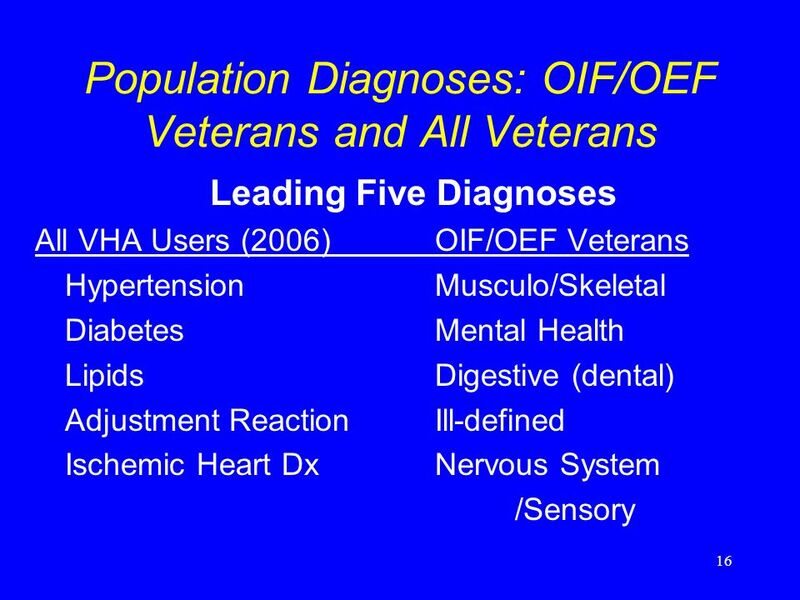 Only well-designed epidemiological studies can evaluate the overall health of OEF/OIF war veterans. 21 21 Follow-Up VA will continue to monitor the health care utilization of recent Global War on Terrorism veterans using updated deployment rosters provided by DoD to ensure that VA tailors its health care and disability programs to meet the needs of this newest generation of OEF/OIF war veterans. 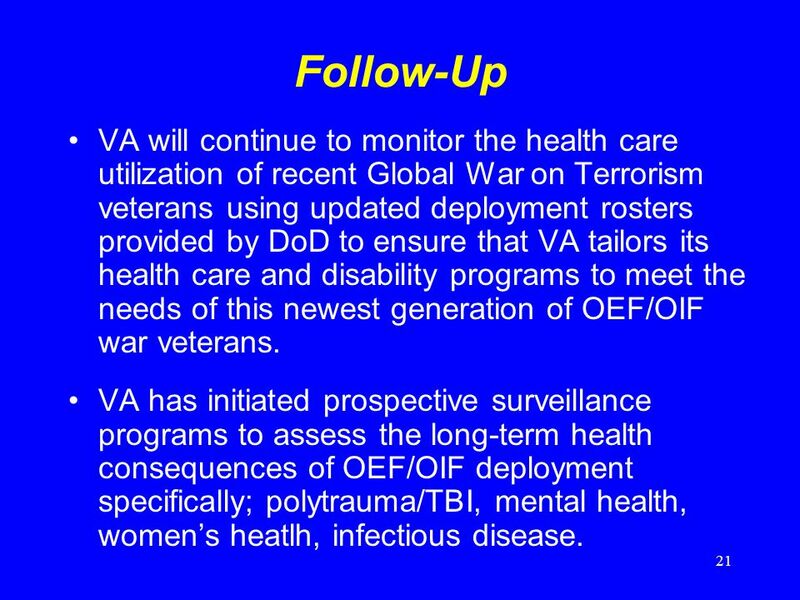 VA has initiated prospective surveillance programs to assess the long-term health consequences of OEF/OIF deployment specifically; polytrauma/TBI, mental health, womens heatlh, infectious disease. 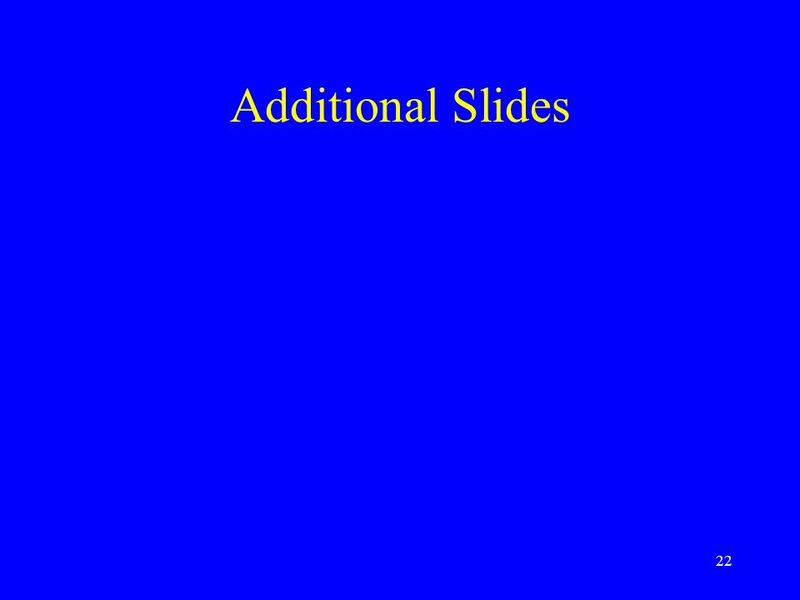 Download ppt "1 Analysis of VA Health Care Utilization Among US Global War on Terrorism (GWOT) Veterans Analysis of VA Health Care Utilization Among US Global War on." The Tax Expenditure for Health: Update for 2007 John Sheils April 29, 2008. National Thousands Block Number Pooling Services NANC Meeting January 13, 2004. 1 Survey of Retiree Health Benefits, 2007: A Chartbook Jon Gabel, Heidi Whitmore, and Jeremy Pickreign National Opinion Research Center September 2008.